Registry is a database where Windows and programs store their data. 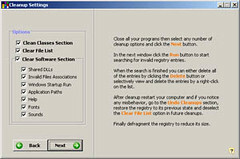 Registry Cleaner is a utility software to make your computer run smoother and faster. When data changes ex: you delete a file, the registry doesn’t remove the invalid data, thus in this case a reference to a non-existent file remains in the registry. As the registry gets filled with invalid data, Windows and programs consume more system resources to search the database for any data. Therefore your computer gets slower and slower. Last but not least, passing invalid data to Windows programs can cause severe system complications resulting in system crash, hang and malfunction. Where can i download a free registry cleaner software for windows xp? rencently.i’ve found another way to speed my poor PC, the software “tuneup 360”.it really works and functional. Actually most times there is no need to rebuild or reinstalled your PC windows system, what you need is Tuneup360. You just need to click one big â€œfix nowâ€ button and get your computer fixed at once. I was wary to say the least about trying another reg cleaner. The last one killed my computer gave me a blue screen, and i had to reinstall the os. Thanks for the links Brother. 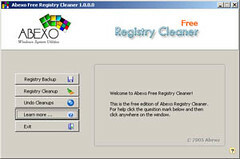 I have downloaded the Abexo Free Registry Cleaner and installed it. It has done a perfect job and I have you to thank for it and Almighty God for inspiring you to do so.